Examples abound of projects supported by travelers’ generosity through PVF’s Generosity in Action Fund. Coordination with tour operators and tour leaders insure that donations are applied as intended to local village projects. Wells and village schools in Burma: The people of Myanmar (Burma) place a great value on education. But the education outcomes are unsatisfactory. According to official estimates, three in ten five-year olds cannot enroll in kindergartens and only 40 percent of those who begin kindergarten finish the primary cycle. Travelers visiting Bagan, one of the most famous historical sites in Myanmar, contributed funds to build a well and replace the dilapidated primary school in the nearby village of Thit-Htaunk-Kun. Educating girls in Bhutan: Travelers on a Backroads walking trip in Bhutan established a fund to support sanitation improvements and educational supplies for the young monks at a remote monastery school. A female traveler in that group to Bhutan commented that helping the young monks was all fine, but how could she make a donation that would help to educate girls in Bhutan. Through the same local guide overseeing the monastery school project, the donor established a $5,000 fund to allow village girls to extend their education for four years. The girls were taken shopping for school uniforms, bedding, toiletries and books to allow them to attend boarding school. 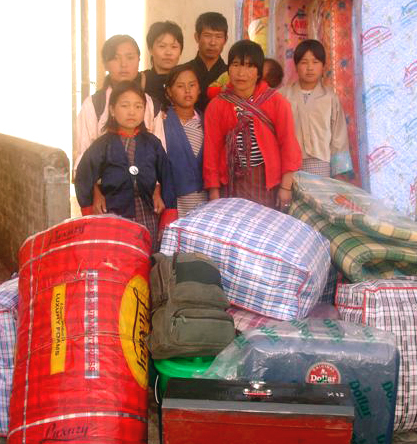 Funds for school fees and supplies are still being sent to Bhutan in small increments as the pictures and reports of the girls’ educational success is documented. Wildlife education and school support in Zambia: Chipembele Wildlife Education Trust is a program that operates in the area surrounding South Luangwa National Park, in Zambia. The objectives of the Trust are to teach local children the value of wildlife and to improve the educational standard of the local schools. There is a thriving tourism business in the area which brings jobs and benefits to the local community, but it is all based on there being abundant wildlife. However, the area is developing rapidly and there are a host of social and environmental problems. One of the most serious problems is that of human wildlife conflict. Elephants, monkeys, baboons and hippos eat crops and stored food and each year several people are killed by elephants and houses are destroyed. Other problems in the area that affect wildlife include poaching and habitat destruction, particularly deforestation as the local people search ever further and harder for firewood and trees for building. Travelers’ generosity supports the wildlife education center and Chipembele’s work constructive school buildings and supplying desks, equipment and books. This entry was posted in Uncategorized and tagged donor, education, international, travel. Bookmark the permalink.